My area of expertise is urban greening. 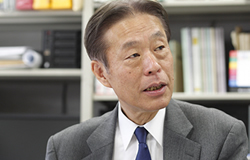 When you hear the term urban greening, you may have the image of comfortable urban development with greenery, but for example, there was a case in which trees in a park stopped a fire from spreading during the Great Hanshin Awaji Earthquake. There are times when water from ponds and garden shrubs can save peoples’ lives as well. The concept of urban greening does not only involve scenery and psychological benefits, there are many viewpoints for actual disaster prevention. In the Great East Japan Earthquake, there were reports of how a small shrine surrounded by trees survived, how houses surrounded by a windbreak sustained less damage than in other areas, and how there was less damage to land behind coastal forests that barely survived the tsunami. It is a fact that in this earthquake, the power of the tsunami was so overwhelming that in many areas, coastal forests had no effect. There were places where coastal forests on sandy beaches fell easily due to liquefaction and instead of curbing the tsunami, the fallen trees became deadly weapons themselves, multiplying damage by destroying houses and hurting people along with the tsunami. Liquefaction also occurred in Tokyo Bay. While it was anticipated that coastal forests would be rendered useless by liquefaction, no countermeasures had ever been taken. In this regard, I recognize, as an expert on urban greening, that this is a matter for great reflection. However, this does not mean that coastal forests are unnecessary. To be sure, the trees were powerless against the kind of massive tsunami said to come only once in 600 years. Can we grow coastal forests that can withstand the power of a massive tsunami such as this one? The answer to that would be, most likely not. However, we can expect a disaster-reducing effect for the kind of disasters that could happen more frequently, such as once every 150 or 300 years. I currently serve as chair for the Committee to Review Park and Green Belt Maintenance Methods for Tsunami Prevention under the Ministry of Land, Infrastructure, Transport and Tourism (MLIT). Up until now, I have been highlighting the importance of trees from an emotional standpoint saying, “It would feel kind of reassuring to have greenery.” Going forward, I strongly feel the need to clarify what sort of damage reducing effects we can expect from trees and green belts in various types and scales of disasters, and present tangible urban greening methods. 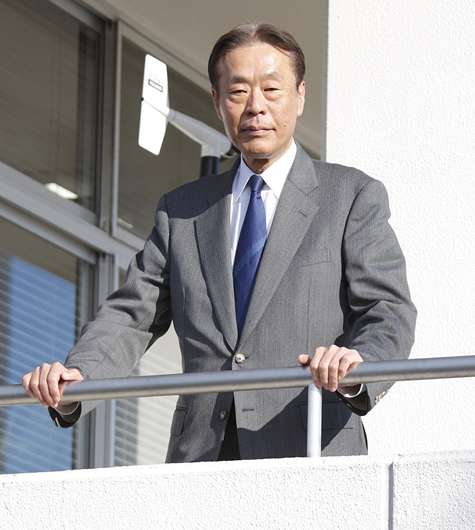 I would also like to restore the coastal forests of the Sendai Plain once again. To this end, collaboration with the engineering side of urban disaster planning is essential. Specifically, I believe we need to think along the concept of multilayered defense, effectively combining concrete levees and coastal forests. An example of such urban planning would be to construct concrete levees as the first line of defense closest to the ocean, cultivate coastal forests as the second line of defense, create embankments with greenery on their sides to function as the third and fourth lines of defense, and build highways and railroads on them. Furthermore, evacuation green belts should be established on higher ground and it is important to secure evacuation routes that lead to them. Along with the Committee to Review Park and Green Belt Maintenance Methods for Tsunami Prevention, I also participate in activities as chair for the Committee to Review Methods to use Disaster Debris for Greening and Other Purposes. This is another project under the MLIT aiming to utilize the debris created by this disaster for greening plans. 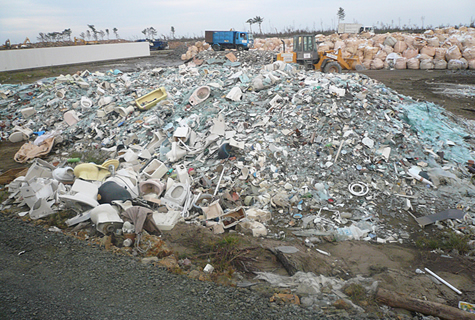 Disaster debris includes concrete, wood, plastic, ceramics, glass, aluminum sashes, and other dangerous objects, as well as tatami mats, cloth, paper which are covered with earth and sludge. For example, concrete can be pulverized and reused. Wood can also be reused as construction material. Plastic can be broken up into chips and used as fuel for heat recovery, and a factory has already been completed for this purpose. Debris covered in earth and sludge will be buried and covered with concrete, and we are considering further covering them with earth to create embankments and making them green. Visiting the disaster areas, I was struck again about how powerful plants were. They pull themselves up again without a word of complaint. Fallen trees in the disaster areas were sprouting new shoots. 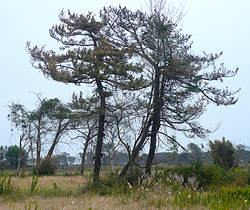 In areas where Japanese black pines and Japanese red pines were growing originally, various types of other trees were starting to grow on their own. The earth in these areas must have been disturbed, causing seeds buried in the earth to sprout. The regenerative power of nature amazed me. 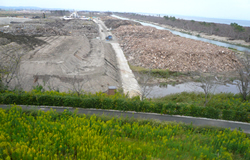 Additionally, at Sendai Airport, which was devastated by the tsunami, the forests cultivated as a noise prevention measure remained standing without being knocked over by the tsunami. These forests were made up of the types of trees similar to those found in natural forests. This provides us with a hint. Multilayered forests that are made up of many types of trees, similar to a natural forest, are perhaps more resistant to disasters than those made up of only one or two types of trees. A forest comprising only one type of tree is more aesthetically pleasing, but there is a risk of the trees all falling at once or dying due to a disease. However, if we plant other types of trees under the black and red pines after they mature, a multilayered forest will be realized. I believe that this may increase the chances of survival in various types and scales of disasters. However, I would like you to note that I am not saying that a forest in a natural state is good. In order to make woods that will be useful to people’s lives, people’s knowledge and care is necessary, just as the people of the past did not neglect care of satoyama (secondary woodlands and grasslands). While harnessing nature’s power, how should people care for these forests? I hope to establish a clear methodology, anticipating various geographies and types of disasters, and put it to use for reconstruction.